Amazon Price: $364.90 $364.90 (as of April 18, 2019 5:00 pm – Details). Product prices and availability are accurate as of the date/time indicated and are subject to change. Any price and availability information displayed on the Amazon site at the time of purchase will apply to the purchase of this product. This product is for training and not for actual use during Sudden Cardiac Arrest. 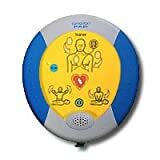 The easy-to-use Samaritan PAD Trainer with remote control guides users through simulated analysis, energy delivery and prompted Cardio Pulmonary Resuscitation (CPR) intervals with the look and feel of a live Samaritan Public Access Defibrillator (PAD) without the actual charge and discharge of an electrical shock. The design of the Samaritan PAD Trainer mirrors the live device in order to ensure greater user retention and system familiarity The Trainer, which is compatible with any CPR manikin system, provides six pre-recorded rescue training scenarios without delivering an actual shock The Samaritan PAD Trainer is available in both 300P/350P and 450P models Note: HeartSine strongly advises that potential users of defibrillators ensure their training is in line with current ERC/AHA Guidelines and are aware of the regulations and guidelines relating to training and the use of an AED in their specific country. "I mistrust the judgment of every man in a case in which his own wishes are concerned."